Take a trip to the African Outback with Exotic Cats, a 5 reel, 243 ways to win slot by Microgaming. Exotic Cats takes you on an exciting safari adventure where you'll see some of the most majestic sights in the world. You'll see tiger cubs learning to roar, leopards racing through the jungle, and lions resting in the sun. Set in a jungle, the design is absolutely beautiful. The wild greenery and flowers make the animals harder to spot so make sure to keep your eyes open. Wildcats may look cuddly and cute, but they can be fierce. 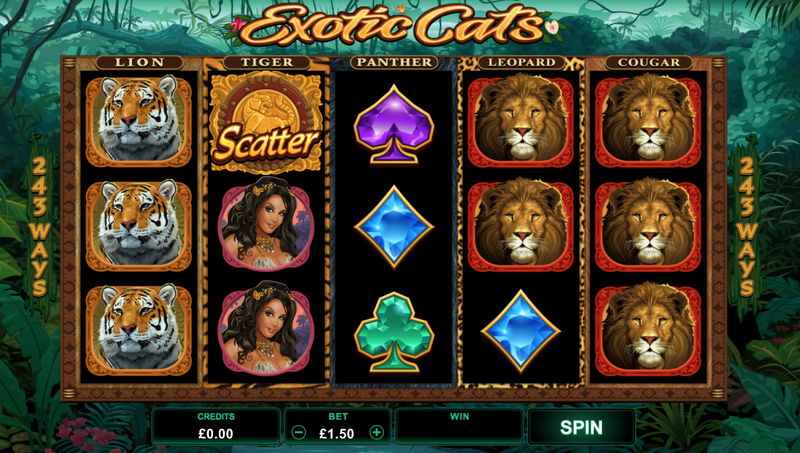 Exotic Cats has some great roaring features including a vertical wilds feature and a free spins feature. To find out more, click here. 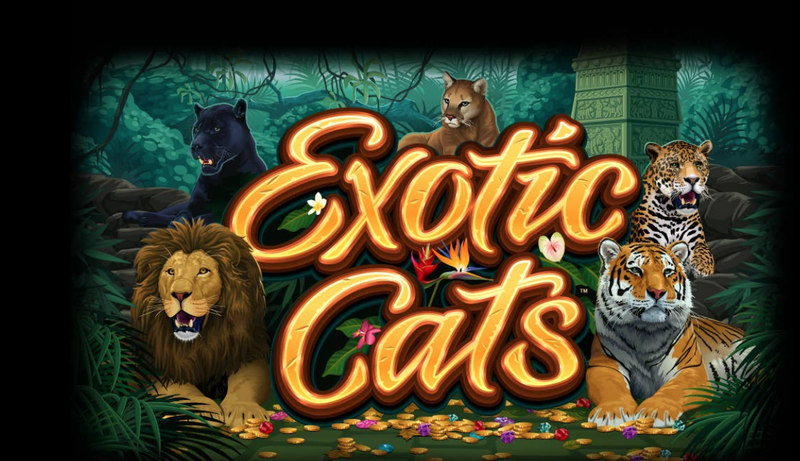 Exotic Cats is a 5 reel, 243 ways to win slot with a big cat theme available right here at Easy. If you love cats then you will love this game! You'll travel through the African jungle and observe these wonderfully majestic creatures in their natural habitats. This is a once in a lifetime opportunity that you do not want to miss. The design is stunning. The reels are placed in the middle of the jungle surrounded by wild flowers, trees, and big leafy plants. If you listen carefully, you may be able to hear the sounds of big cats roaring. Symbols include leopards, panthers, lions, and tigers, as well as clubs, hearts, diamonds and spades. There's also a giant gold coin, paw print, and explorer. The Wild Symbol - The wild symbol in this slot is the Exotic Cats icon. This substitutes all other symbols on the reel bar the scatter to form winning combinations. Vertical Wilds Feature - Above the reels, you will find the name of each cat. If you land a cat in the right category, it will turn wild. For instance, if you land 2 tigers in the tiger reel, you'll receive 2 wilds. Free Spins Feature - To unlock the free spins feature simply land 3 or more gold coin scatters. Once you have unlocked this feature, you will be given 10 free spins. If you land 3 more scatters you will benefit from an additional 5 free spins. Microgaming is considered to be the world's first true online casino. They have been creating games since 2004 including casino, bingo, sportsbook, and quickfire. Microgaming holds the current Guinness World Record title of paying out the largest jackpot in an online casino slot. The winner was from the UK and won a whopping €17,879,645.12! If that's not a reason to love Microgaming then we don't know what is! Microgaming slots are loved by millions of gamers around the world. With over 100 slots on offer, you're bound to find something you love whether you enjoy girly slots, animal-themed slots or sporty slots. If you enjoyed Exotic Cats, why not check out these popular Microgaming titles? There's nothing cuter than cats (well, maybe dogs). Exotic Cats is a beautiful game with a great big cat theme. The animals are beautifully illustrated and the animal sounds in the audio are fantastic and go with the game perfectly. The vertical wilds feature is a unique and fun one. Landing cats in the right reel could award you some pretty good cash prizes. Follow this link to discover more.